Was This Mysterious "Yellow Rain" a Chemical Weapon or Bee Poop? In 1981, the United States didn't have the best political reputation vis-à-vis Vietnam. So when the US Secretary of State made allegations that the USSR had sprayed both Vietnam and Laos with chemical weapons, the world went crazy. Then the world got confused. In 1981 the Vietnam War was over, for the United States, but it looked to the world like the Cold War was still being fought in Southeast Asia, and it had a nasty new wrinkle. The Soviets were spraying Vietnam and Laos with something that left odd yellow spots on trees. The trees would sicken, and some would die. A similar thing would happen to people in the region, as they were felled by a mysterious toxin. What awful thing was happening? According to the Secretary of State, the USSR was fighting insurgents by spraying chemical weapons. The Secretary of State's announcement was the result of a six-year investigation. The poison, called Yellow Rain because it fell from low-flying craft in liquid showers, was finally pinned down when army toxicologist Dr. Sharon Watson recognized the symptoms it caused. It was a toxin derived from fungi, and resembled the trichothecene mycotoxins that often poisoned Soviet citizens when they showed up in grain supplies in the Soviet Union. And yet, once the news went public, there was an odd twist. When the Yellow Rain dried, it became yellow dust. Some of that dust was pollen, but pollen that seemed to have been stripped of proteins. This revelation led scientists down an entirely different road. They knew some low-flying things that took pollen, digested it, stripping it of its proteins, and then let it drop. The Yellow Rain, many civilian scientists did and still do claim, was nothing more than bee feces, dropped by swarms moving through the jungle. As for the mycotoxins, any fungus that was in Russia was on the same continent, at least, as Southeast Asia. The disturbance of the air, and the "rain" might cause people to inhale the fungal spores or other fungal products in ways they otherwise wouldn't. So who's right? That depends on who you ask. Recent reports uncovered the fact that the Soviets had tested mycotoxins on their own prisoners as potential chemical weapons. On the other hand, in 2002, people outside Calcutta panicked when a green-yellow rain came down on them. Many believed it was chemical warfare. 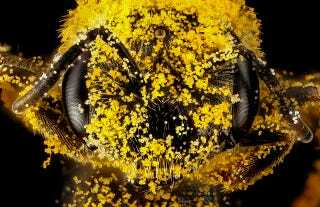 A pollution scientist trundled over and reported that it was a golden rain of bee poop.